We were at a friend's house today, meeting a new baby -- Naomi Elizabeth Schroeder. After holding the sweet baby, Cate found something else to hold. 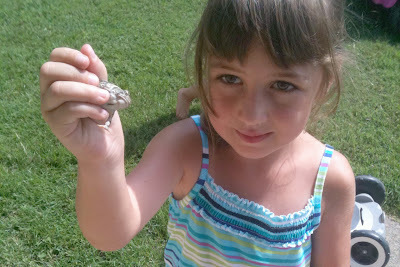 I was a little surprised by her interest in the frog, but proud of her no-fear attitude in wanting to hold it. And then she decided we should take it home. It should be noted I did not want to touch the frog. Lilly was Cate's responsibility if she was coming with us. Even in a box. We were going through Taco John's drive-thru when Cate made one of the air holes bigger. "Just make sure Lilly doesn't jump into the van." And right as I finished my sentence, Lilly jumped into the plastic, where the hole was becoming increasingly bigger, and jumped right on out of the box. Cate picked her back up and was holding her. On our way to meet friends at the pool, I realized we had nowhere to contain Lilly. So I suggested Cate let Lilly go. "But I really like Lilly," Cate said, as if I'd implied she didn't like her. Obviously she likes her, otherwise we wouldn't have had a frog in the van. "Lilly will really like being about to hop around outside," I said, thinking of how to spin this to Lilly's advantage, thinking Cate would be more accepting of my proposal. "She'd get really hot in the car while we swim anyway." With tears streaming down her face as I opened the side door closest to Cate, she dropped Lilly on the sidewalk next to the Taco John's drive-thru. "I'll miss her. She's really cute," Cate said between sobs. "I know you will miss her, but she'll be happy to hop around here," I said, hoping Lilly jumped away to her newfound freedom to support my point. Cate was still in tears while I paid for our food and started to drive away toward the pool. I ended up circling back around Taco John's to show Cate that Lilly had already hopped away. Thank God the frog really had moved from the sidewalk by the time we passed by. Several times in the past 7 1/2 hours since we let Lilly go, Cate has told me she misses her. "Do you miss her too?" I couldn't really find the words to answer. We'd only had Lilly in a box for an hour, maybe not even that. And I didn't really even want to touch her. Something tells me this isn't the end of our frog stories. Cate and Greg have already been outside along the small creek that runs through our front yard looking for a frog. Cate hopes to find Lilly. And, really, I suppose anything is possible, especially because Taco John's is only four-tenths of a mile from our house.